Our Academy courses are hosted by Multi-Award Winning Digital Marketing Speaker, Author & Trainer – She has just been awarded Best Female Speaker @ The Professional Speaker Awards. Our sole mission is to maximise digital marketing profits to scale and grow businesses. As much as we are a training provider and digital strategy agency that is just the means of achieving the goal of increasing reach, attracting more of your audience to take action and generate leads that ultimately convert into profitable customers. We empower our clients to implement, manage, measure and improve digital marketing campaigns to drive their business forward. Corporate In-House Training – Worldwide! 14 x CIM Commendations – 99% Pass Rate! BEST PRICE GUARANTEE – SAVE 20%! We live, work and consume in the digital age. Yet 50% of companies don’t have a digital marketing strategy and many don’t have the right digital talent. Need a speaker with over 20 years experience? Learn Online – Anytime & Anywhere – 24/7! Dawn has a wealth of knowledge from digital tools to proven strategies and has worked both with clients and delegates over 20 years to assist in getting the best return on investment from their marketing efforts. We have reached an amazing milestone in 2017 when we welcomed our 20,000th student – In the same month we were awarded our 10th commendation from The Chartered Institute of Marketing for excellent results achieved and a 99% pass rate! Provider of Digital Marketing Training & Qualifications – Business Consort became a Chartered Institute of Marketing Academy back in 2012 but has been a long established digital marketing agency and training provider. The business started 13 years ago as a digital agency and also hosted high-end business networking events across the UK. Our Head Office is in Wilmslow in Cheshire and Business Consort has a 17 strong team assisting in sales, marketing & support across the UK. We also have training venues in London & Manchester and out state of the art online learning portal supports a worldwide alumni of online distance learners. We are passionate about developing digital skills in business so our course content has been structured to accommodate real world business marketing scenarios. Due to the fact we are a digital agency not only marketing our own business but also specialising in working with clients to up-skill their teams, develop strategy and manage campaigns to improve overall digital marketing effectiveness we practice what we preach on a daily basis. 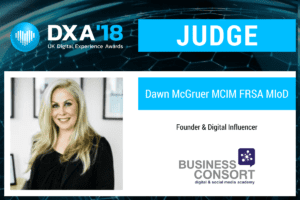 Our Founder Dawn McGruer MCIM FRSA MIoD has been invited to judge The Digital Experience Awards (DXA) which are awarded to businesses providing an exceptional customer experience through the use of digital technology. As an award winning digital marketing trainer, practitioner, consultant, author and speaker who has become a key influencer in the world of digital over the past 20 years having amassed over 5 million subscribers and a 45,000 strong LinkedIn network. She is the Founder of Business Consort who provide digital marketing training courses and qualifications and is accredited by The Chartered Institute of Marketing and was established in 2005. The academy has developed it into a world leading training organisation having trained & certified over 20,000 students to date. She has over 10 commendations from the CIM for outstanding results achieved by her students achieving worldwide recognised qualifications such as the CIM Digital Diploma in Professional Marketing. In addition, she also was shortlisted for the CIM Marketing Excellence Award ‘Marketer of the Year’ earlier this year. Dawn has trained 1000’s or organisations including some of the world’s largest Global brands across most industries and was invited as a lifetime Fellow of the RSA – The Royal Society for the encouragement of Arts, Manufactures & Commerce founded in 1754. This invite comes as recognition of her expertise in the field of social media marketing and her work to raise awareness of the advantages of social media to business owners.